Their idea is that the loss of the object awakens the feeling of mourning in the owner as they have witnessed its decline. It makes the owner want to rediscover the object, as it is in their memory and has, in some way, become a part of them. To explore this theory in greater detail they started using sand as a material to create ephemeral, finite objects. ‘Sand made’ is a material developed with one of earth’s most abundant natural resources and is made of a combination of sand & sawdust. Employing a traditional process and a touch of alchemy, particles of sand and dust are shaped and formed into objects. “The idea behind this material is to make products that can last for a long period of time, and slowly crumble back to dust at the end of their lives, leaving behind just grains of sand and other minerals harmless to the environment”, Marc explains. – The production process involves handmade casting. By altering the pressure applied, the strength of the object can be altered, with increased pressure leading to an object which is inherently stronger. – A wide range of temperatures can deliver vastly different results. By drying the sand mixture in the sun, it will retain its shape but is also heavily affected by the environment, such as being unresisting to water and leading it to quickly disintegrate. If the mixture is cooked in a kiln, the material is much harder and significantly resistant to the effects of the environment, eroding over a much longer period of time. – By increasing the percentage of added minerals and other compounds to the mixture, a more solid and stronger material can be created – suitable for such objects as garden furniture. As an answer to the increase of waste in modern society, the material can be used to create packaging for luxurious or precious gifts. 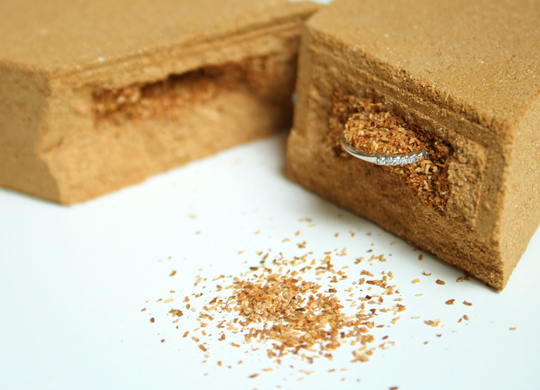 Packaging made from sand allows one to ‘discover’ the gift. Destroying the packaging during its opening provides a unique sensory experience and creates a long-lasting memory for the person who receives the gift. Once the packaging has fulfilled its purpose, it can be broken down to sand by hand, and disposed directly back to the environment. Treating the sand mixture using traditional ceramics techniques, a stronger material can also be created suitable for outdoor furniture such as small benches and indoor accessories such as lamps. What does the future hold for the material? Find more information about the sand packaging here. Thanks to Emma P. Borgstrøm. Maria is creator and editor of ‘Hello Materials Blog’, creator of “My Darling Materials” and one of the ‘Change Makers’ at the Design & Innovation team at the Danish Design Centre. She follows closely the development within the environmental- , technological- and material area, and with a background as a trained cabinet maker Maria also has a broad, professional knowledge of materials. This entry was posted in Material Innovation and tagged Alien & Monkey, Sand material, Sustainable packaging. Bookmark the permalink. Sand is a very noble material, as well as a task to work with. This is very interesting! I suggest you to also check out Leetal Rivlin, I posted a few of her designs at my blog http://inmatteria.com/2013/09/10/sand-as-the-main-character-from-israel/. Hope you like it! Love your blog!